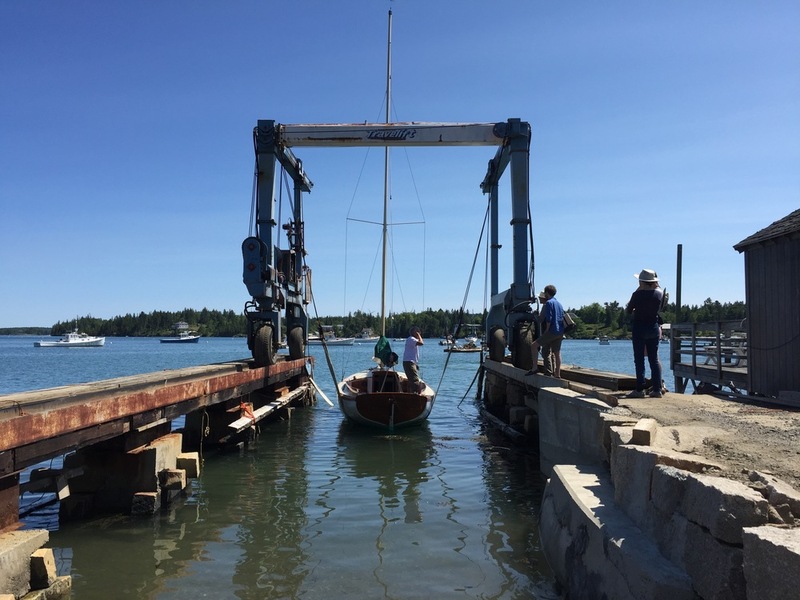 The designer of Fred Martin's 25 ft., Herreshoff inspired daysailer's could be a pun on all the work that went into it this spring. It started sinking when it was put in, as wooden boats will, which fried the electric motor and the battery pack. The crew towed it over to the yard with water lapping at the cockpit floorboards and Jon Emerson went to work with Phil the famed marine electrician. They installed a new wiring harness, set of batteries, and electric motor. While the boat was hard up Jon also fitted a shortened boom and accordingly sized set of sails. With new electrics, new canvas, she was launched with some fanfare from the Martin family. The new motor didn't work as a result of some sort of technological non-compatibilty nonsense. Good Fred Martin went sailing everyday anyway, according to reports the boat looks much better in the wet. When the Martin's departed for a spell Jon and the yardboys installed a new motor and the daysailer is finally ready to go.